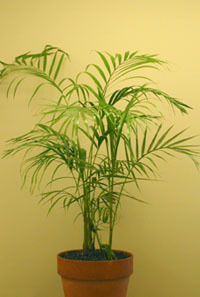 Houseplants are not only beautiful in the home, they also help cleanse the air. Bamboo palm, Spider plant; flowering Mums; Peace lily plant and Mother-in-laws-tongue, are just a few of the best houseplants for purifying air in the home, according to an ongoing two-year study by NASA and the Associated Landscape Contractors of America (ALCA). Formaldehyde is found in virtually all indoor environments. Its major sources include urea-formaldehyde foam insulation, particle board or pressed-wood products. Consumer paper products, including grocery bags, waxed paper, facial tissue and paper towels, are treated with urea formaldehyde resins. Many household cleaning agents contain formaldehyde. It is a toxic chemical. Trichloroethylene and benzene are two other toxic chemicals that can be residual in the air of our houses, since it is presented in things such as paints, inks, plastics and adhesives. In the NASA/ALCA research it was determined that some plants are better than others for purifying the air indoors. Gerbera daisy, Dracaena Marginata, Peace lily (Spathiphyllum), Dracaena 'Janet Craig' and Bamboo palm in order were the five most effective plants in removing Trichloroethylene concentrations from the air. Gerbera Daisy, pot Mum, Peace lily, Bamboo palm, Dracaena Warneckei, English ivy and Mother-in-law's tongue are the seven top houseplants for removing Benzene concentrations in the air. Bamboo palm, Dracaena 'Janet Craig', Mother-in-law's tongue, Dracaena Marginata, Peace lily, green Spider plant, and golden pathos are seven of the top plants for removing concentrations of Formaldehyde in the air. Em suma, algumas das melhores plantas para purificar o ar do seu quarto de químicos são a palmeira de interior Chrysalidocarpus lutescens, o aloé vera, a hera comum, o bamboo (uma das melhores), as Dracaena, a Chlorophytum, as gerberas, a Ficus robusta ou macleilandii, a Aglaonema ou a Spathiphyllum. A Rede apela à tua colaboração!